Soccer in Seattle – End of an Era or Just a Chapter? Steve McClare does a nice job of recapping the history of pro soccer in Seattle in his latest European Weekly article. For those who need to catch their breath and mull over the ending of the 15-year run of the Seattle Sounders of the United Soccer Leagues, this post might be coming too soon. If so, please accept my apologies in advance, and rest assured that GOALSeattle.com is all about keeping Seattle soccer history alive. I am choosing to look forward only because that is what my heart is telling me to do. There is so much to anticipate, so much to ponder, so much left undone that will very soon take shape and be done. I like the phrase I used when we were getting out the vote to call Seattle MLS the "Sounders." It was: "Tradition from the first kick." My attempt at blending the past with the future, the old clubs with the new. It is indeed a brand new day. Expansion player draft: The MLS expansion draft will take place shortly after MLS Cup, perhaps as early as November 25th. Sounders FC will want a head coach in place before the draft. I wonder how long before the draft they'll shoot for? You would think they would want some time for the coach to study his player options. Of course Schmid and Paul Mariner (another coaching candidate) know the MLS rosters well. Schmetzer has the time to study up. Full kit reveal: As the winter shopping season gets underway we'll likely see more of Sounders FC's uniform and get a chance to buy one. Will the away kit be revealed and go on sale in December, too? Starfire Digs: The target date to have Sounders FC practice fields ready to go is December 2008. Club offices are also being finished at the Tukwila soccer haven. 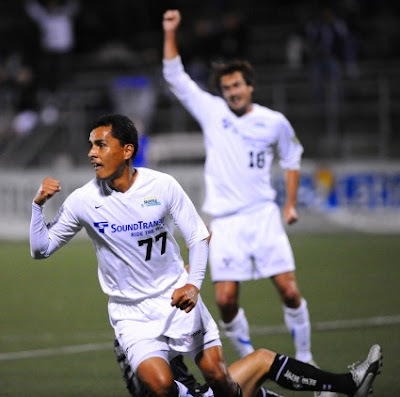 MLS SuperDraft: Sounders FC have been carefully scouting college talent in preparation for the MLS SuperDraft. The draft will take place in St. Louis on January 15th. The first round will be televised on ESPN2. Sounders FC have the first pick overall and in each round unless they decide to make a trade. See links on the GOALSeattle Sounders FC Roster Page. January transfer window: The next FIFA transfer window opens in January 2009. Sounders FC may point to that window when looking at foreign talent. First Sounders FC training camp: The earliest day that MLS clubs can ask players to report to camp in Saturday, January 26th. No doubt Sounders FC will be ready to get going on that day. 2009 MLS Season Schedule: While there is no 'set date' for the league schedule to be released, it has happened as early as February in the past. Sometimes the league releases the opening week fixtures and then the rest later on. The 2008 schedule was released on February 7th. Advertising & Ticket Sales: We can anticipate that at some point we'll see TV ads for the new club, perhaps to boost ticket sales. Right now Sounders FC have stagnated at just under 18,000 full season tickets. It is a tremendous number, best in the USA. They've got a goal of getting to 20,000 by April and selling out all home matches at around 25k. Radio Deal & other Voices: We know that King and Kong are on board with Kevin Calabro. The next step is announcing the radio part and who'll be joining Kevin in the other broadcasting areas. It was a good weekend for local clubs not called Sounders. Seattle's life in the USL First Division came to a close after a wild 3-1 loss knocked the Sounders out 4-3 on total goals over the two-match playoff series with Montreal. A fan posted the photo below on the internet. It shows the referee's 'encroachment' call on a made Seattle penalty kick may well have been in error. (Seattle is in blue). Steve McClare has more on the Sounders at ProstAmerika. The Washington Husky Men and Women came through with an entirely winning and entertaining 'double header' on Sunday at Husky Soccer Field. The women beat ranked Hawaii 2-1 in overtime and then the men edged Gonzaga 2-1 before almost 3,000 fans. The amazing story of the 2008 Seattle University Redhawks Women continues as the club playing their first year in NCAA Division One again conquered their foes on the road. On Friday the Redhawks nipped Fresno State 2-1. On Sunday Seattle beat Cal State Bakersfield 2-0. The Women are now 5-2-3 on the season. The Redhawks Men visited traditional rival Simon Fraser in BC on Saturday. Here is a video highlight reel showing the goal that gave the Redhawks a late 1-0 victory. www.KitsapSoccerClub.com is now online and taking name the club votes and suggestions. Seattle Pacific's Falcon Men remained undefeated in GNAC play after a 2-0 victory over Northwest Nazarene Saturday at Interbay. The 4th-ranked Falcon Women shown well in a 3-0 win at Billings against Montana State. Up north in Bellingham, Western Washington University Vikings Men needed an own goal to draw 1-1 at UC-Colorado Springs. They had beaten Northwest Nazarene 4-0 on Sept. 25th. The 16th-ranked Western Women stomped Nazarene 4-1 last Thursday. 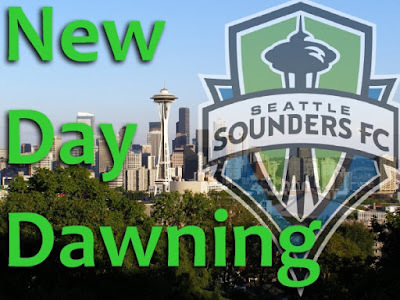 Guest blogger Dave Clark takes a look at how Seattle Soccer Show's Mati Bishop's player ratings could indicate which USL players are ready to make the jump to Sounders FC and Major League Soccer. Of course there are caveats, some very large IFS. Let's address those first. The biggest issue is, who is the Seattle Soccer Show and why should we trust their ratings? Mati Bishop has been writing and speaking about pro soccer for several years, including a few in the booth for the USL Sounders. He has handled the primary duties as the player rater, but consider his role in the booth he has been following the game as close as anyone this past year. Matt Gaschk is sportswriter for the P-I and a producer at KJR-AM Seattle. How do we know these ratings are close to what Hanauer and Henderson feel about the players? Quite simple we don't. We can't know, but we can make some connections, we can take as large a sample set as possible, and guess. That's what people on the outside looking in always have to do. Taking those two large caveats into account, let's look at how the four players who will be on MLS clubs next year were rated in their performances with the USL Sounders this year. 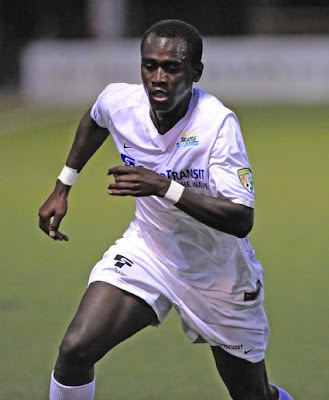 The highest rated was Sanna Nyassi who averaged a 6.42, capped by his 9 point first leg playoff match v. Montreal. Ciaran O'Brien had a 5.83 in his limited time. Sebastian Le Toux had a 5.41. Nik Besagno had a 5.31. If that is considered the benchmark the following players should be given a very serious look due to their performance on the pitch this season - Josh Gardner (6.21), Hugo Alcaraz-Cuellar (6.00), Leighton O'Brien (5.94), Taylor Graham (5.92), Chris Eylander (5.63) and Youssouf Kante (5.63). Is there a place for Hugo on Sounders FC? I think that seeing Eylander, Gardner and Graham on that list gives it some overall validity, but what is more intriguing is that if we set the cutoff at the 5.31 that Nik Besagno was awarded overall Danny Jackson, Kevin Forrest (MLS draftee in '08) and Kevin Sakuda make the list. Is it reasonable assumption that up to 11 players from the 2008 USL squad could make Sounders FC's roster next year? Considering that they get 10 discovery claims and two are already signed that answer is yes. Book four of the Seattle Soccer series is already under way, and this year has been a long prologue, but the men in Rave Green will be in camp soon battling to see if they are starters, substitutes or reserves for the 2009 Qwest for a Sheild or Cup. Thank you to ProstAmerika for inspiring this post with their compilation of player ratings throughout the latter part of the season. I am Dave Clark and I can be found at Sounder at Heart providing statistical analysis and uncovering hidden gems in foreign leagues. The United Soccer Leagues Seattle Sounders have played their last match. In a riveting second leg the Montreal Impact beat Seattle 3-1 to take the series four goals to three. The match was a roller coaster of emotions and events. Montreal drew level 2-2 by going up 1-0 in the match only to have the Sounders retake the lead 3-2 a few minutes later. Montreal again drew level, only to have Seattle apparently go ahead again on a penalty kick by Hugo Alcaraz-Cuellar. 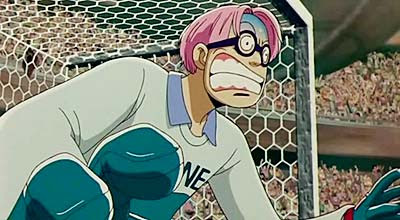 The official deemed that a Sounder had moved into the penalty area before the kick was struck, so he ordered a retake, which Hugo blasted off the crossbar. In stoppage time Montreal scored the series winner with both sides down to ten men. It was a wild match, a disappointing result and yet a heroic effort for the Sounders. We are proud of the Sounders and their hard-fought efforts to bring us another title in 2008. Now we look to the new club and new opponents in Major League Soccer. The Seattle Sounders are history. Long live Seattle Sounders FC. The Sounders are in Montreal today for a 2:00 PM Kick-off of their second leg playoff series with the Impact. 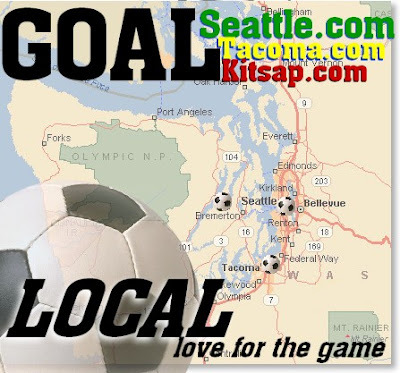 GOALSeattle will be updating the match live from the USLlive.com feed in our chat room. Come join us and chat while the match is in progress! Read the entire match report from GoSeattleU.com here. Burnaby, BC-Saturday’s men’s soccer match between Seattle University and Simon Fraser seemed destined for overtime until Kyle Peterman (Boise, Idaho) scored with less than four minutes remaining in regulation to give the Redhawks a 1-0 victory at Fox Field. C.J. Hamel (Seattle, Wash.) sent a crossing pass into the box that found Peterman, whose side kick beat Clan goalie Thomas Lindley to break the scoreless tie. The goal was Peterman’s third tally of the season, second-most on the team, while Hamel earned his second assist of the year. The other Redhawk star of the match was goalie Emerson DeOliveira (Normandy Park, Wash.), whose five saves came in bunches. His first save came less than a minute before the end of the first half, and then he made back-to-back saves twice during the second half. Simon Fraser first threatened midway through the second half, but shots by Liam Miller and Lucas Barrett were stopped by DeOliveira. A second flurry came with less than 13 minutes left in the second half, but attempts by Scott McEachern and Miller in a 48-second span were turned away by the junior. The most important thing on the night was that the Sounders gave themselves at least a fighting chance in Montreal on Sunday. Seattle's gutsy 2-1 win in leg one will give them a slim one-goal advantage with still at least 90 minutes to play in Quebec. Hugo celebrates his goal that put Seattle up 1-0 in the 15th minute. See Rick's match photos here! Beyond the battle on the pitch were smaller confrontations that kept fans, officials, police and security busy through the night. 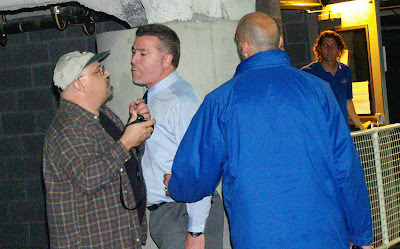 Montreal head coach John Limniatis (light blue shirt) approaches fans he thought had heckled him during the match. Montreal players arrive on the scene as a Sounders official (blue jacket) steps in. Montreal head coach John Limniatis unbelievably came out into the stands after the match with his jacket removed. Later he spotted some fans, including myself, who he had heard / seen heckling him briefly during the match (I had called him 'Looney.') He bumped chests, spewed vulgarities, and became incredibly and quite unprofessionally 'unhinged.' As we tried to make our way past and to the cars, a Sounders rep held him back. Curious onlookers stood in disbelief as Montreal players then came down from the showers to see what was happening. The players then also began taunting fans and hurling insults. GOALSeattle photographer Jenni Conner caught some photos of the incident. 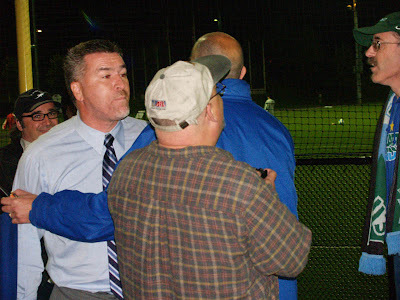 Limniatis confronts fans as they try to make their way to the parking lot. Yes, the guy in the cap is me. Control of the match was lost by head official Edvin Jurisevic, who issued 8 yellow cards and two reds that resulted in an ejection for each side. Kevin Sakuda and Stefano Pesoli will miss the second leg on Sunday. Seattle led 2-1 at the half after Hugo Alcaraz-Cuellar scored in the 15th and Leighton O'Brien converted an iffy penalty kick call in the 42nd. Pesoli had brought the Impact level 1-1 in the 21st. Who knows if the one-goal aggregate lead will hold for the Sounders, but the club did win a big home match and end a night of raw emotions with a glimmer of hope that the ride may not yet be over. 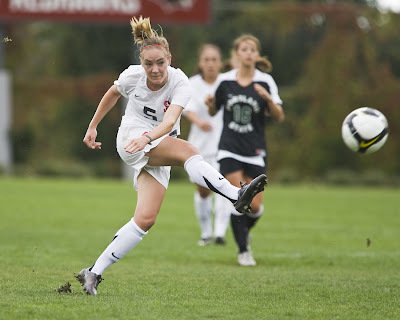 GOALSeattle.com welcomes Bellevue native and Seattle Prep graduate Maryann Boddy and the Seattle University Redhawks Women to our blog! Maryann will be 'guest blogging' all about the Redhawks Women for Seattle soccer fans this Fall. In my very first blog I mentioned that SU soccer needed to prove itself as a Division I program. After this weekend we’ll be exactly halfway through our season and already have a lot to be proud of. We’ve proven to the NCAA we can compete at a high level, having beat a few teams in the WAC and Big Sky. We’ve proven to our coaches that we are talented and hardworking players, as each game this season has been extremely close. And we’ve proven to ourselves that we accomplish very big things, winning the Idaho Governor’s Cup and giving WSU, a Pac-10 team that was ranked last season, a challenging game. Granted we lost 2-0, and we have much to improve on, but we played very well. We nearly got on the board first when Kahlyn Keilty-Lucas chipped a perfect ball over the top for Jamie Coe who beat her defender and the keeper for a dramatic header that ricocheted off the top post. As we prepared for our game against Portland State last weekend, there was just one thing left to do. Boddy kicks against Portland State. SU Athletics photo. It was finally time to prove to our school that we are a new and improved D1 program. The buzz and excitement surrounding the first of my last home games at Championship Field was felt all around campus. The freshman seemed to multiply, flying around the dorms, student center, athletic training room and the locker room each shadowed by a recruit. The seniors busied themselves fulfilling essential duties like grocery shopping, cooking team meals, and creating vital pre game pump up mixes. And even though amusing ourselves with guessing games, late night trips to the grocery store for our “buddies” and blasting Black and Gold at max volume in the minivans are standard ways to get pumped on the road, there’s nothing like coming home to a field with SU painted in the heart. We started the game strong, energized and eager to show off for our friends. The match report indicates we outshot Portland State 16-8 and held a 13-2 corner kick advantage. What you can’t read is that we won just about every air ball, denied countless attempts over the top and played with heart, determination, and class. We were a very versatile team, with players able to shift and fill foreign positions while defender Maria Madeira recovered from a head jab and I from a concussed skull. We knew we were the better team, we played like we were the better team, but unfortunately we weren’t able to get the result we were looking for. However, we played 110 minutes of action packed soccer for a sold out crowd. I’ve never before in my 5 years at SU played in front of 700 fans at home; this was truly an experience I’ll never forget-especially as it ended in a trip to the ER. I want to thank all of our friends, faculty, staff and family who made it out and supported us through the battle. We’re very proud of ourselves, and we hope you’re proud of us too. I've added two new features to the three soccer blogs I post in. You can now subscribe easily to GOALSeattle, GOALTacoma and GOALKitsap blogs by clicking the menu in the top right corner on each blog. You can now link your blog and show you follow these Puget Sound soccer blogs by using the "Follow" menu at the very bottom of all three blog's pages. Being a soccer fan in our area completely rocks right now! We've got Major League Soccer on the way in Seattle, PDL soccer on the way in Bremerton, and a very successful, fun to watch club wearing yellow in Tacoma. If you ever want to send along any content, links or ideas for any of the blogs, just email me at goalseattle@gmail.com or post in the comments area. We are the SOUND of Soccer! Updated 9/26: Match day stories appear in the Seattle Times and the Montreal Gazette today. USLsoccer.com previews the entire round. Predicting how the Seattle Sounders will do in the upcoming USL playoffs is about as tough as predicting the Presidential election race or how the current economic woes will play out. It is made more difficult by the Sounders themselves. A team full of talent that is as healthy as they have been all season, yet one that just completed a dud of a home stand by winning only 2 out of 7 matches at Starfire. Opponent Montreal Impact are in their own little world these days, having rallied from near-bottom of the table to finish 3rd place, all the while continuing a run of success in the CONCACAF Champions League. You would think the fact that the Impact played last night in Montreal against Mexican power Atlante (0-0 draw), and now must cross the continent by flight and then bus it from Vancouver, would be a significant help for the Sounders. History says no. Just a bit more than two weeks ago Montreal were playing their fourth match in eight days and made a similar trek to Tukwila on minimal rest and two days between matches. The Impact bested the rested Sounders that night 2-1. The Sounders have yet to play a 'complete' match all season against a USL club. They've displayed enough offense accompanied with defensive breakdowns, or little offense along with defensive solidity. In the playoffs these kinds of inconsistencies are deal-breakers. Do the Sounders have it in them? While it is hard to place bets for the club, we'd be foolish to bet against them, too. After all, these are the guys who have won it all the last two times they have qualified for the playoffs (2005, 2007). They've got the talent. They've got what appears to be a scheduling advantage. They've got all to play for. Will the real Seattle Sounders, defending league champions, finally be making an appearance in the USL in 2008? Why do these WC mascots always seem so, um, weird? SEATTLE - The Washington men's and women's soccer programs will hold a joint alumni barbecue, Sunday, Sept. 28, at 1:30 p.m. at Husky Ballpark. The gathering will be held during the break between the Husky men's and women's doubleheader, on the grass area outside the stadium, down the first base line. The event is free and open to all Husky soccer alumni. The Washington women's soccer squad will kick off the doubleheader hosting Hawai'i at noon at Husky Soccer Field, with the men's contest with Gonzaga to follow at 2:30 p.m.
To RSVP or for more information on the event, please contact assistant men's soccer coach Richard Reece at rjreece@u.washington.edu or 206-616-1123. Alumni who RSVP will receive free admission to the matches on Sunday. Donations are also welcome. WALNUT CREEK, Calif. - Washington senior midfielder Raphael Cox was named the Pac-10 Men's Soccer Player of the Week for Sept. 16-22, Commissioner Tom Hansen announced today. Cox was instrumental in the Huskies' 3-2 overtime victory against No. 24 New Mexico to win the Husky Fever Classic on Sunday. The victory also gave head coach Dean Wurzberger his 200th win at Washington. The Tacoma, Wash., helped the Huskies come back from a two-goal deficit against the Lobos, scoring the equalizing goal in the 79th minute and the gamewinner in the 98th minute. It was the first multiple-goal effort for Cox who earned All-Pac-10 second-team acclaim last season. The UW Daily student newspaper has a feature on the Husky Men: Men’s soccer hopes to ride old and new to victories. Already making a mark with the team is freshman forward Brent Richards from Camas, Wash. He is a regular starter and has led the team in shots on multiple occasions including, most recently, the Husky Fever Classic in which the Huskies were victorious. Playing alongside Richards is another rookie, midfielder Dylan Tucker-Gangnes, a product of Bainbridge Island. Matt Hulen's free kick scores for the Wolves. After a string of five matches without a victory (0-2-3), and numerous players out of action due to injuries ranging from the serious to nagging, the Wolves seemingly got back on track on Saturday. Facing SPSL Premier newcomers, Junior Professionals, at Valley Ridge in less than ideal playing conditions, the Wolves got out to an early lead when captain, Matt Hulen scored off of a free kick just outside the 18-yard box. Hulen evaded the wall and beat the keeper near post to make the score 1-0. In a match that the Wolves would dominate on the stats sheet, the scoreline was close for much of the 90 minutes. Shortly after taking the lead, the Wolves conceded a sloppy goal. A passback to Wolves' GK Peter Lechak was mishandled. While the ball was caught up between Lechak's feet, a JP forward slide tackled knocking the ball back and into the goal. For the complete match recap, visit SeattleWolvesFC.com . OleOle.com takes a look at ten possible Seattle Sounders FC mascot choices. "Tuggy" stands a real chance. Well, at least until the English fans convert his name to "Tugger." 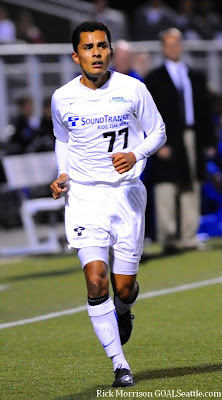 Raphael Cox plays summer ball with Tacoma Tide FC. 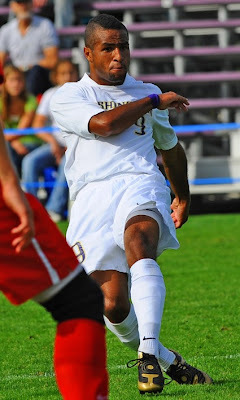 SEATTLE - Senior midfielder Raphael Cox helped Washington mount a late comeback over No. 24 New Mexico, scoring both the equalizer in the 79th minute and the overtime game winner in the 98th minute as the Huskies defeated the Lobos, 3-2, in the final round of the Husky Classic, Sunday. With the victory, Washington (4-3-0) won its 12th Husky Classic title in the 20-year history of the tournament. The Huskies opened tournament play Friday with a 1-0 win over Cal State Fullerton. The victory also marked Dean Wurzberger's 200th win as the head coach of the Huskies. Washington fell behind early on a pair of quick goals from New Mexico's P.J. Wilson and Michael Green in the 11th and 18th minutes. But the Lobos (3-3-2) were forced to play the last 21 minutes of regulation two men down due to a pair of red card ejections. The Huskies proceeded to capitalize on their advantage with three unanswered goals. Junior defender Taylor Hoss and Cox scored a pair of goals within four-minute span to equalize in the 75th and 79th minutes. Then it was Cox who netted the overtime gamewinner at 97:40. Read the entire match story at GoHuskies.com. Round-up: The Washington Women finally lost their first match, 3-0 at Illinois. The Seattle University Men lost 2-1 in San Jose. The SU Women drew their home opener before a capacity crowd 1-1 with Portland State. The 4th ranked Seattle Pacific Women went up to Bellingham and lost to 22nd ranked Western 1-0. The Western Front Line has a feature on the Vikings Mens' 2008 squad. Kevin Sakuda strikes the goal that brought Seattle to within 3-2. The Vancouver Whitecaps scored three straight goals in the second half to beat the Seattle Sounders 3-2 on Saturday night at Starfire Sports Stadium. With the loss the Sounders finish the 2008 USL-1 season with a 10-10-10 record. The ten wins is the fewest regular season wins ever for any club called "Sounders," dating back to 1974. The Sounders finish sixth in the USL table and will play Montreal Impact in the first round of the playoffs, which begin on Friday at Starfire Sports Complex in Tukwila. The night was a disappointment to a packed house and to the Sounders players, who stood at midfield afterwards sort of looking at the ground or off into space. The USL Sounders have played their last regular season match. It is almost over, and the script being written is not to the liking of this cast of characters. The defense of the 2007 Commissioner's Cup (best regular season record) had long since gone by the wayside. 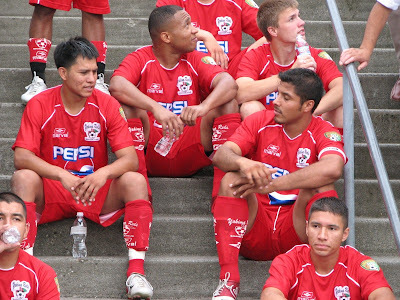 Puerto Rico has claimed the 2008 version.The Cascadia Cup is the latest to fall out of reach. The Whitecaps win the cup going away with 13 points to Seattle's 8. Still left is a chance to redeem a lost year by making a run in the playoffs. More than merely a run, though, Seattle would need to go all the way and repeat as league champions to erase the mediocre regular season, the derby loss and the second straight loss in the US Open Cup Quarterfinals. It seems unlikely at this point, with the Sounders' form writing losing chapters. The 2008 Sounders have rarely come together as a team on the pitch, seldom found the right mixture and the final pieces of the puzzle. They've been out hustled on many occasions, out played and out coached at home and away. This group of players remain a talented bunch who peaked as a unit in 2007 and have relapsed in 2008. Injuries have played their role, and it was no different tonight with Taylor Graham sitting out in central defense. A shame it came down to a few moments of weak defending and plenty of missed offensive chances, but the night was a capsule of the whole season in that way. Bookend goals by Sebastien Le Toux and Kevin Sakuda simply were not enough to offset the Whitecaps second-half rally. Seattle leaves the Cascadia Cup derby behind having won it twice. Vancouver have now won it three times. "Fullerton is not an easy opponent, so I'm very pleased with the result," UW head coach Dean Wurzberger said. "I think we deserved to win, although it looked like it would go into overtime. I'm delighted. It gives us a chance to turn our season back in the win column." Read the entire match story here. We are rounding the corner and heading for the home stretch in naming the Sounders FC head coach. In the lead this week, due to two recent stories, is Columbus Crew head coach Sigi Schmid. SoccerByIves.net puts his odds at 5 to 1 while GOAL.com's Kyle McCarthy puts Schmid at the top of his list, too. The Seattle Soccer Show talks with legend Cliff McCrath on this week's show. The Whitecaps club site previews the match here. The Sounders do the same here. The Seattle Times weighs in on Sounder emotions heading into the last regular season match here. Did you catch the SoundersFC.com story on the ECS and local soccer fans? The Emerald City Supporters are gearing up for the Cascadia Cup 'Final' and have a song for you to learn. 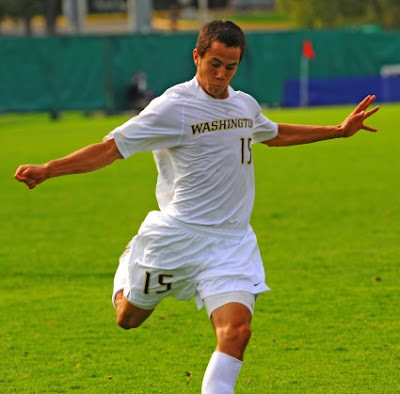 The Husky Fever Soccer Classic is being hosted by the Washington Men this weekend. UW, Portland, New Mexico and Cal State Fullerton make up the field. The Local Match Calendar reveals that the Seattle University Women are also back home and will host Portland State at Championship Field on Sunday at 1:00 PM. The Olympian has a story on the Fife High School Girls' soccer club as they try to defend their 2A State Title. PNWLocalNews.com is a great source to check up on your local school soccer clubs. Most local editions report scores and often do feature stories on local sides. Thanks to Whitecaps supporter Krammerhead's captures we can now look back at three moments in the Seattle-Vancouver derby. Peter Beardsley comes up big before 60,000 fans at BC Place as the Whitecaps edge the Sounders. Vancouver's Southsiders smoke out the Sounders in Burnaby. I'd like to use this post to share links to some other Seattle soccer bloggers. New to the blogging community is SounderAtHeart.com. After only a few posts it's clear this blog will focus on the details and give insight backed up with facts. Nice addition! The Beautiful Game in the Emerald City is quality and today has posted a list of possible Sounders FC coaching candidates. 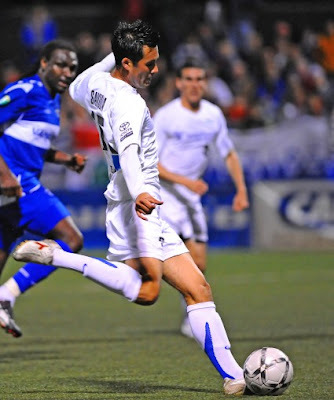 Don Ruiz at the Tacoma News Tribune blogs about local soccer on the professional side. JMayers looks at the world of football in The Beautiful Game. The Soundersfootblog is a look inside the mind of a Sounders fan and his reflections on the club and game. TheOffside.com has a Sounders FC blog. Give Steve some time, he's still in Chile' and will be blogging more when he gets back home. The Seattle Soccer Show posts its popular player ratings list in their blog. Not set up as bloggers, but providing excellent coverage for Seattle soccer fans are The Seattle Pitch with Ron Stickney's match reports, ProstAmerika.com with Steve Clare's fine writing, and SoccerSeattleStyle.com with Paul and Chuck Davis' devotion to the Sounders shining through. GoSounders.com deserves a bookmark for setting up a feed where you can get updates for many of the sites above all in one place. The Emerald City Supporters are refining their web presence at WeAreECS.com. 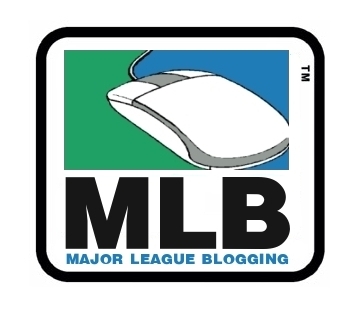 Did I miss your blog or site? Post the link in the comments section or send it to me at goalseattle@gmail.com. I set my nostalgia ray guns on high and shot for the heart with this new slide show from www.GOALSeattle.com. I'm feeling betwixt and between as the USL Sounders enter their last regular season week as a professional club. Or is the truth that I refuse to grieve properly? After a long Summer in which the Wolves competed in 3 leagues and 6 tournaments, the Fall SPSL Premier League arrived a few weeks too early. With many injuries to the Wolves' players that have only had two weeks off from training in the last seven months, the club's sides have not looked fresh in matches lately. 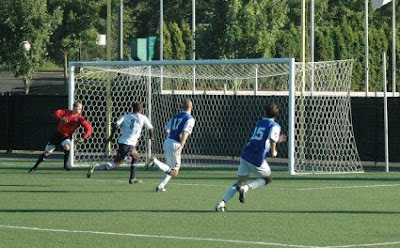 On Sunday, the Wolves opened their Fall SPSL Premier League season against rival Seattle Americans. High pressure put on by the Wolves in the first 10 minutes of the match created scoring opportunities, but once again a lack of finishing kept the Wolves off the scoreboard until later in the half, and would potentially haunt them later in the match. In the 28th minute a well-served ball played up the field from near half-way by captain, Matt Hulen, met forward, Solomon Gold in the 18-yard box. Solly one-timed the pass to Walter Antoniuk, who netted the game's first goal at close range, leaving the Seattle Americans GK no chance at making the save. Minutes later, winger, Emanuel Luvert created space in the Wolves' offensive corner and played a ball on the ground across the top of the 18-yard box. Willie Cardenas let the ball go through his legs to an on-rushing Matt Hulen, who curved it near post over the American's GK for the Wolves' second goal. 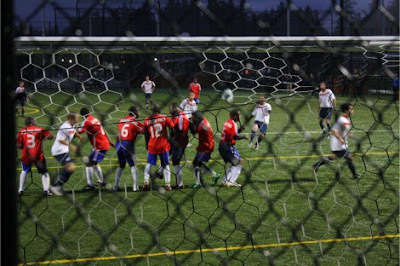 The Wolves fought back to draw the Americans 3-3 at Starfire. At this point the match seemed well in hand, with the Wolves controlling most of possession and executing their game plan effectively. The score remained 2-0 Wolves at halftime. But, as with many football matches, this is a game of two periods, which can often be drastically different. Half-time substitutes would prove costly for the Wolves, as players did not link up well in the second half. From the start of the second half, the Americans controlled possession much like the Wolves had in the first half, and within 20 minutes had a 3-2 lead. Poor defensive shape and marking allowed probing runs and crosses across the goal mouth to be put away easily as the Americans came out with something to prove after having let the Wolves dictate play in the first half. Shocked, but knowing that there was plenty of time, defenders Dave O'Neill and Brian Lubeck calmed their side and got back to business. Several crowded attempts in front of goal were thwarted by the Americans defense, but in the 80th minute one such attempt produced a bouncing clearance which was volleyed into the goal by Wolves' defender Daniel Scott from about 18 yards out, leveling the score at three each. Minutes later an American's counter attack produced a 1-on-1 with defender Daniel Kwakye, Kwakye tackled in the box, seemingly getting ball, but was cautioned and the Americans received a penalty kick. With the back and forth nature of the match, this penalty would certainly seal the match for both sides. And when Wolves' GK, Peter Lechak parried the shot around the post to his right, the Wolves were happy to take away a point from their opening match with the always tough, Seattle Americans. This Saturday at 7:00pm, on Starfire field 3, the Wolves will take on the Junior Professionals in the second match of the season. The full Fall SPSL Premier League schedule is below. 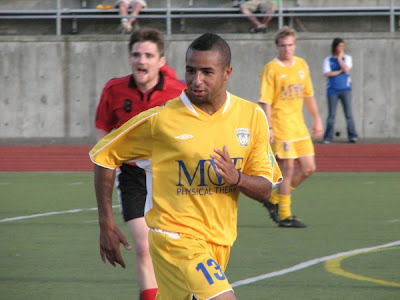 Stay tuned to SeattleWolvesFC.com for all Wolves’ news, scores, and more. PORTLAND, Ore. - Junior Veronica Perez scored her sixth goal of the season in the 56th minute and added an assist, giving the Washington women's soccer team a 3-1 victory over Northern Arizona Sunday on the final day of the Portland Nike Invitational at Merlo Field. The victory gives the Huskies a 6-0-0 record this season, tied for the second-best start in program history. The 2000 team, which went on to win the program's only Pac-10 title, also started 6-0-0, while the 2004 team, which went on to make an Elite Eight run, started 8-0-0. The Huskies shut out San Diego State 2-0 on Friday. The Washington Men lost 3-1 at Portland on national TV Friday night. The Seattle University Redhawks Men continue to pick off NCAA Division One foes as they journey around the country. In Florida the Redhawks beat Gulf Coast 2-1 on Friday and then went double overtime the next day to edge Florida Atlantic 2-1 on a clinching goal by sophomore Wesley Van Hooser. The Redhawks are now 5-0 against D1 opposition. The Seattle Pacific Falcon Men went 1-1-1 last week with a 1-1 draw at San Francisco State, a 3-0 win at Colorado Christian and a 4-1 loss at Metro State. The Seattle Pacific Women beat Cal State Monterey Bay and then drubbed Notre Dame de Namur. 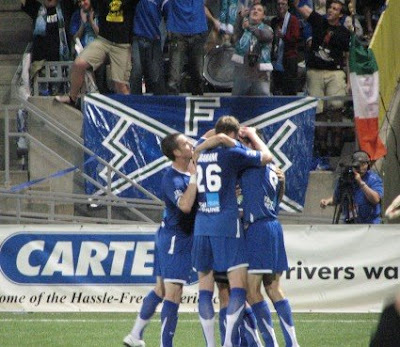 Le Toux scores and Emerald City Supporters celebrate. It wasn't stylish and it wasn't a victory, but it was enough. 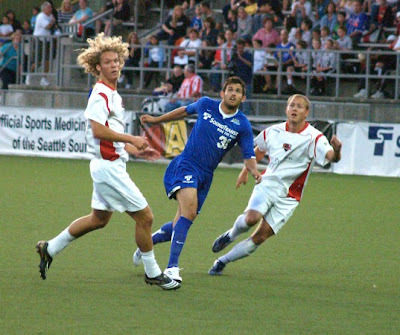 The Sounders drew 1-1 with the Atlanta Silverbacks on September 13 at Starfire Sports Stadium to clinch a spot in the United Soccer Leagues Division One playoffs and thus earn a chance to defend their 2007 Championship. No one was talking 'repeat' after this latest performance once again failed to bring the best out in Seattle. While there was improvement over the loss against Montreal on Wednesday, much still needs to improve if the Sounders have any hopes of making a playoff run. Sounders enjoy taking a 1-0 lead on Atlanta. Seattle went up 1-0 38th minute when Kenji Treschuk had the ball on the left side, and worked it past a Silverbacks defender into the box. Dribbling it almost to the end line, Treschuk sent a cross zipping along the turf toward the left post. LeToux ran onto it and rammed it inside the post from a couple yards in front of the net at 37:26. Atlanta tied it midway through the 55th minute. Macoumba Kandji, out the past five games (all of them Atlanta losses) with a high ankle sprain, came downfield on a counterattack, got past two defenders into the box, then beat Chris Eylander one-on-one from the top left corner of the goal. The Sounders could still finish anywhere between 3rd and 6th as the final week of the regular season comes around. I've posted Rick Morrison's match photos from Wednesday night's tilt with Montreal. 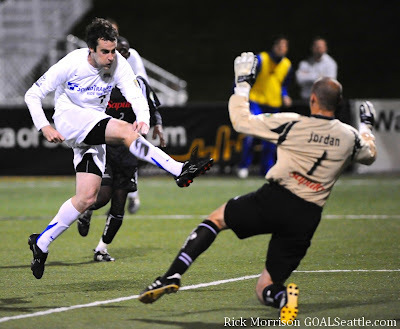 You can visit Rick's GOALSeattle match gallery here. Current Sounders 'franchise' off to Bremerton, PDL? 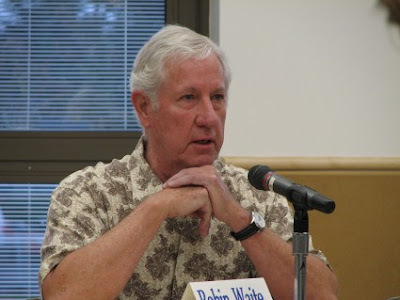 Current Sounders part-owner Robin Waite addressed the gathering in Bremerton last night. The current Seattle Sounders 'franchise' looks to be moving to Bremerton and joining the Premier Development League (PDL) in 2009. This is the 'franchise' only, meaning current Sounders part-owner Robin Waite can transfer his USL ownership over. The 'Kitsap Soccer Club' will have a new name in its new league. Read my recap of the September 11th Bremerton public meeting over use of Bremerton's Memorial Stadium for pro soccer. 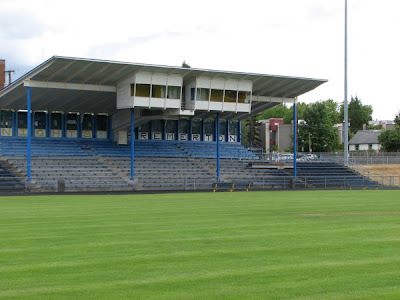 Future home of the PDL Kitsap Soccer Club? Meanwhile this pretty much puts to rest the hope that a United Soccer Leagues First Division Club will remain in the Puget Sound region. Unless, of course, Tacoma Tide FC have found investors willing to make that leap. The rumor mill is beginning to churn out a few names and leaks as we count down towards the naming of the first Sounders FC Major League Soccer head coach. Seattle Sounders FC, the expansion franchise set to begin playing in 2009, offered Vermes its head coaching job and he has passed on the offer, sources with knowledge of the offer told SBI on Thursday. Sources have also told SBI that the job has also been discussed with one current MLS head coach. According to sources, Seattle has already reached out to three different coaching candidates, including Vermes and at least one current MLS head coach. Current Seattle Sounders head coach Brian Schmetzer had been believed to be the front-runner for the Sounders FC position when the club was formed, but it has become clear that Henderson is looking for a head coach with MLS experience. Schmetzer was recently identified as a candidate for the job by Seattle general manager Adrian Hanauer. Yesterday the Arizona Republic quoted New England Revolution assistant coach Paul Mariner as saying he has his 'fingers crossed' for the Seattle job. The Seattle Sounders lost 2-1 to Montreal Impact last night at Starfire Sports Stadium in a real head-scratcher. The Sounders didn't show up for the slow, scrimmage-like first half, and then when a spark finally arose they just as quickly imploded with sloppy defending and an inability to finish in front of goal. Montreal's Tony Donatelli tangles with Seattle's Zach Scott. Zach Scott and Josh Gardner appeared to be the only Sounders with a pulse in the first half. In the second Gardner remained active and Scott fell completely apart on both of Montreal's 'gift' goals. Yousouff Kante played a nice second half. Montreal went up 1-0 after the Sounders came out in the second half and put together a nice (but goalless) string of possession and shots. Against the run of play the Impact netted a counter-attack goal. It was Toni Donateli netting the first score on an assist from Joey Gjertsen after a breakaway in the 59th. Yousouff Kante scored the Sounders' lone goal. The Sounders drew level 1-1 when Kante blasted the back of the net after a scramble gave him the ball at the top of the penalty area in the 62nd. Soon after the implosion was complete when Zach Scott passed a ball across his own goal mouth and past Sounders goalkeeper Chris Eylander. All that was left was the tap-in, which Montreal's Antonio Rabeiro did with no problem in the 70th. The head scratching goes on. The match was attended by the one of the smallest home regular season crowd in years. The covered stand was about 1/4 full but spread out, while the opposite stand had about 100 fans. My guess puts the crowd in the 600 range, though the club announced 2,500. Have something to say about the match? 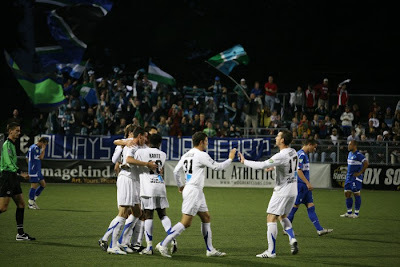 (Seattle, Wa)- The Seattle Sounders (10-8-9) take on the Montreal Impact (11-10-5) Wednesday, September 10 at Starfire. Kickoff is set for 7:00 p.m. PT. After nearly a two week break, Seattle returned to league action on Saturday with a 3-0 win over the Miami FC Blues. 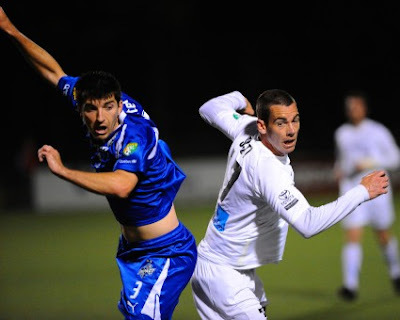 Leighton O’Brien, after missing nine games including six in league play, returned to the midfield and scored two goals in the victory. Sebastien Le Toux added the third, his 12th of the season (2nd in the league behind Alex Afonso, 14) and dished out an assist to O’Brien in the 77th minute. Both players earned USL-1 Team of the Week honors. The clean sheet was Chris Eylander’s 10th of the regular season, 14th in all including U.S. Open Cup competition. Seattle has now won two straight scoring a combined seven goals, after having beaten the Carolina RailHawks 4-3 on August 24. Next up is the Montreal Impact, playing its 400th match in club history and first of a two-game West Coast road trip that ends in Vancouver on Saturday. In its last game played on Monday, the Impact defeated the Portland Timbers at Saputo Stadium 2-0 behind goals from Leonard Di Lorenzo and Peter Byers. The Impact have won four straight and are in fifth place (38 points), just one point behind Seattle. A win clinches a playoff spot for both Montreal and Seattle. 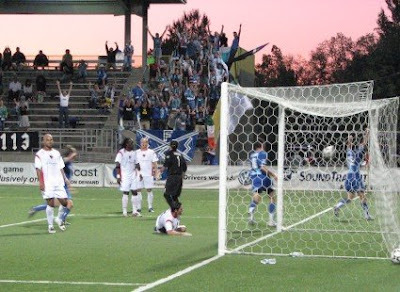 Earlier this season, the Sounders tied the Impact 1-1 on June 28 at Starfire, and won 1-0 on July 13 at Saputo Stadium. All-time the Sounders are 13-8-2 against the Impact. The match marks the final regular season game in the history of the rivalry. The Sounders are in sole position of fourth place in USL-1 with 39 points just one point back of the Rochester Rhinos. Puerto Rico (49 points) and Vancouver (47) are at the top of the table. Montreal is fifth (38 points) with four straight wins; defeating Portland (9th with 31), Atlanta (8th place with 32) twice, and one over Carolina (10th place with 27 points). Charleston is in sixth place, one point back of the Impact. Minnesota sits in the seventh and final playoff spot (33 points), but are just one point ahead of Atlanta, who will be in Seattle on Saturday. ARRIVE EARLY FOR SEASON’S FINAL GAMES! Don’t miss your chance to see the Sounders final run in their storied history starting this Wednesday at Starfire against Canadian rival Montreal Impact, tickets are available at www.ticketmaster.com. After Wednesday’s game the Sounders play the Atlanta Silverbacks, September 13 and the Vancouver Whitecaps on September 20 in the regular season finale and Cascadia Cup deciding match. SEATING AT STARFIRE IS LIMITED AND ON A FIRST COME FIRST SERVE BASIS; ARRIVE EARLY AS LARGER CROWDS ARE EXPECTED FOR THESE HISTORIC MATCHES. In an effort to have a 'home page' where fans can go for information GOALSeattle has started a 2009 Sounders FC roster page. If you have links, rumors, ideas, information or news you think should be a part of this central page please post in this blog reply area or send to goalseattle@gmail.com. I was talking with a couple of photographers on the sidelines at the Sounders match last Saturday and realized that even beginning to talk about Major League Soccer roster rules is a real headache. Further, there are terms such as "DP," "Allocation," "Senior Roster," "Developmental Player," Discovery Player," "Generation Adidas..."
We might just need a dictionary section. 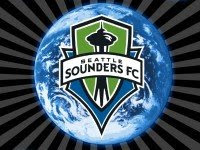 Please help build this page while Sounders FC build our 2009 club.